On the second of this month [October], we commemorate the Holy Hieromartyr Cyprian and Justina the Virgin. Lovingly welcome the sword and dying with Justina. 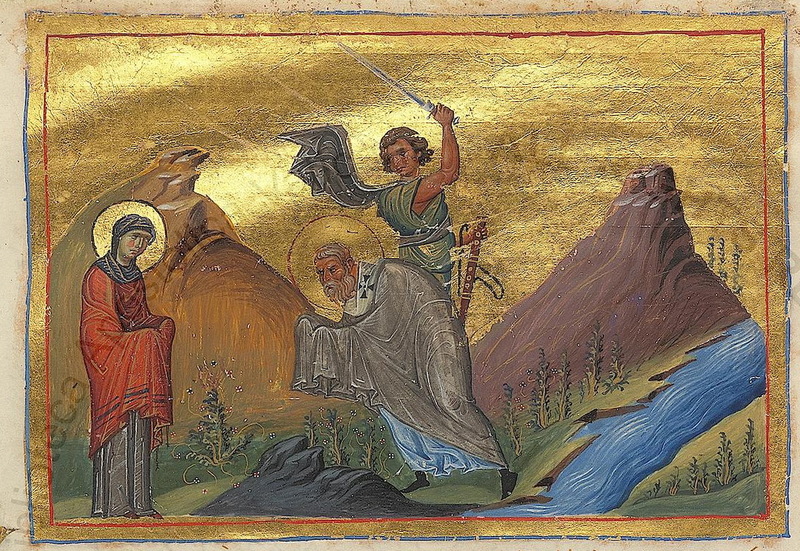 On the second Cyprian together with Justina was beheaded. Cyprian was from Carchidon, or Carthage,* in Libya, but passed his time in Antioch of Syria during the reign of Emperor Decius (249-251). He was a rich noble, as well as a philosopher, and a magician at his pinnacle. He was brought to the Christian faith in the following manner. 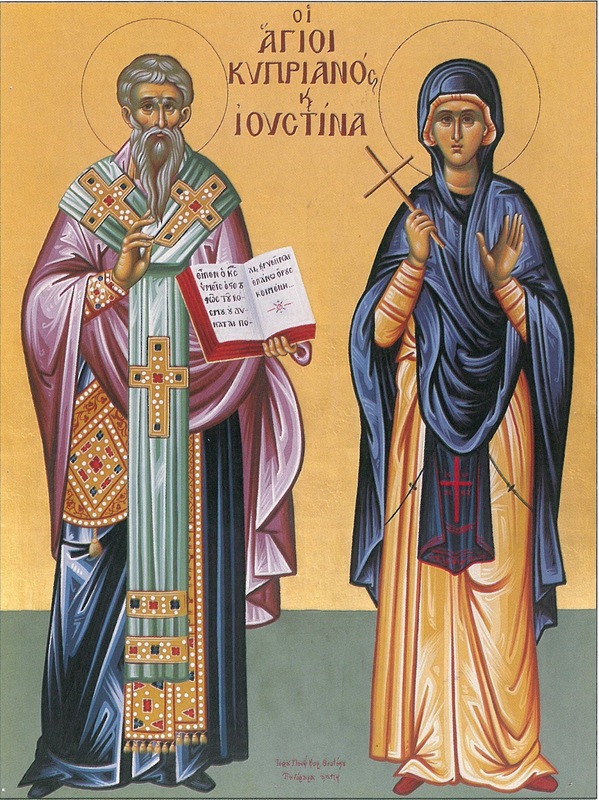 A Greek man named Aglaias fell in love with a virgin maiden, who was a Christian by faith, from Antioch, whose name was Justina. Unable to attain what he desired, what did he do? He went to the divine Cyprian, and begged that with his help he would be able to achieve his evil purpose. Cyprian read his books of magic, and sent many and various demons to beguile the maiden, and attract her towards the passionate love of Aglaias. Then he sent to her the leader of the demons. However, he was unable to accomplish his purpose. Being sensible he realized by this the invincible power of Christ, by which the maiden put the demons to shame, and without avail they returned to their sender, and he immediately turned from his delusion, and believed in Christ. In order to give the Bishop who was to baptize him more certainty that he was firm in his faith in Christ, he immediately brought out all his books of magic, and he burned them all in the presence of the Bishop. Thus he became a sheep in the rational flock of Christ through Holy Baptism. He was then ordained in steps as Reader, Subdeacon, Deacon, Presbyter and lastly he was ordained the Bishop of Carthage. 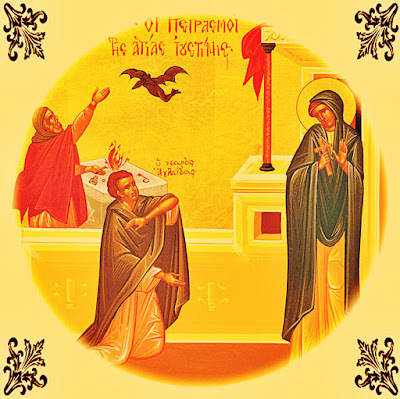 * He also renamed Justina, who was previously known as Justa, and she was numbered among the Deacons of the Church, and made her the Mother and Abbess of the hermitages found there. Having increased his flock by his words, and with his God-loving and virtuous life, and being filled from sunrise to sunset with the knowledge of God, he was finally brought before Emperor Decius. He therefore stood before him, and appearing above every flattery and threat, he was exiled. Because even in exile he did not cease taking care of his flock, and continuously supporting them through his letters, and by this he was victorious in erasing every delusion of idolatry, for this he was arrested by the count of the East named Eutolmios, and he was imprisoned together with the virgin Justina. Later they stood together in judgment at Damascus. Having both boldly confessed Christ, for this reason Cyprian was suspended and scraped, and Justina was struck in the face without mercy. They were then put into a lit furnace. But with the power of Christ, they were preserved unharmed from the torment. This wondrous thing was seen by the colleague of the count, whose name was Athanasios, and he senselessly broke down. And wanting to show his gods were higher and better than Christ, he called upon the false gods Zeus and Asclepios, and running he leapt into the lit furnace. Immediately the impious one was burned up. Considering what he should do, the count decided to send the Saints to Nicomedia to the emperor at the time Claudius (268-270). When Claudius learned of the steadfast and unalterable minds of the Saints, he had their heads cut off. 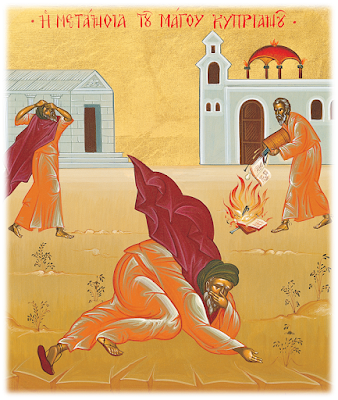 In this way the thrice-blessed ones received the unfading crown of martyrdom. Their honorable relics were taken secretly by some Christians, who had just come from Rome, and they returned to Rome once again, bringing with them the written testimonies of the Saints. ** And they treasured the relics on a famous hill of the city of Rome, where they work many healings for those who run to them with faith. * Many sources, including Oration 24 Of Gregory the Theologian and Saint Symeon the Metaphrastes, confuse Saint Cyprian of Carthage with Saint Cyprian of Antioch. As a result, Saint Cyprian of Carthage is not commemorated in the Orthodox Church, though some do commemorate him on September 16th, which is the date of his repose and commemoration by the Latin Church. ** This may a reference to the work titled Confession of Saint Cyprian, said to be the work of Saint Cyprian himself, though this is doubted by many. Nonetheless, it was influential to people like Gregory the Theologian, who used the work through his Oration 24 to inspire the Christians to turn away from the idolatry of Julian the Apostate..
Thou didst abandon ungodly darkness. and become a light of the truth. Thou wast illustrious as a pastor, and wast glorified in contest. 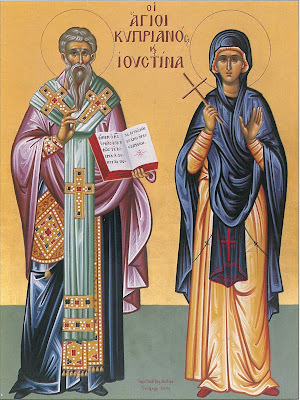 O Venerable Father Cyprian, together with godly Justina pray to God the Creator for us. Thou didst renounce magic for the knowledge of God, and become a wise healer for the world. Together with Justina thou dost cure those who honour thee: with her pray to Christ our God the Lover of mankind that He may save our souls.